If you’ve never really cooked with olive oil, this is a great place to start! These potatoes are crispy on the outside and soft on the inside–like big, fat, flavorful homemade fries. Only much, much healthier. So quick and easy—especially with the microwave shortcut. We make this at least once a week. 1. 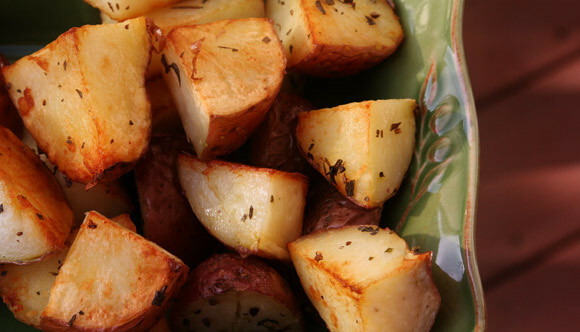 Pierce each potato a couple of times with a fork. Place in a single layer in a microwave-safe baking dish and cover with plastic wrap. Microwave on High until the potatoes are about half-tender, about 5 minutes. Carefully remove the plastic wrap (watch out for the steam! ), and let the potatoes cool until easy to handle. Cut the potatoes lengthwise into quarters. 2. Heat the oil and rosemary in a large skillet over medium-high heat until the oil is hot. Add the potatoes. Cook, stirring occasionally, until crispy and golden brown, about 8 minutes. Season with the salt and pepper and serve hot.